I got the game Sleeping Dogs (xbox version of course) back last month as a birthday present. I did not get much time to play it as we headed off on holiday, but once I got absorbed into it again. It is a free roaming, story driven virtual Honk Kong. It is of course in the style of Grand Theft Auto IV, as that really defined the genre. You take your character from place to place in various vehicles that you buy or steal. You choose to follow main mission quests to advance the storyline and/or take on side missions, races, favours and challenges. 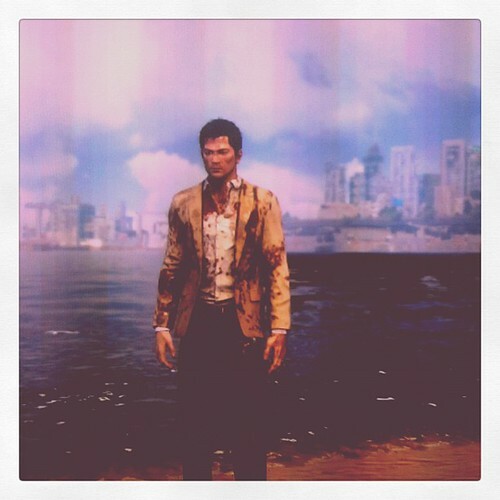 Sleeping Dogs differs in several ways and advances the genre very nicely. The main advance is the quality of the hand to hand combat. Being set in Hong Kong it has a martial arts flavour to it. When you engage in combat it is more like a virtua fighter/tekken style to the combat with lots of techniques and counters to play with. You don’t know all your moves at the start, you have to learn and earn them. This keeps the fighting fresh as you level up and get new moves to try. The fighting is almost always you versus multiple opponents too which keeps you on your toes. Having practiced a martial art (Choi Kwang Do) for the past 8 months I now look at game fighting with a different eye. Choi is defensive and not used aggressively but this is game space and it is good to see some of the differing styles. The fights do go on a bit though as its all about health bars. Later on there are guns and shooting too to add to the variety. As this has RPG elements you do of course end up not winning every fight, you have to level up through other activities. A filtered instagram shot of the screen 🙂 it shows the style and the sort of mess you get into. The levelling up also comes in various strands. The story is split into police work and triad work. You are an undercover cop with split loyalties. Each of the major story arc points provides extra skills in a level tree. Each only has 2 branches but provides enough thought and variety that you get to contemplate how to spend that 1 level point you have just earned, without being swamped. in the end though you should end up with them all. Another levelling up, which occurs across all the missions is your reputation or Face. This gradually builds up the more you work the more you get. Each level then provides a perk. In case the missions, driving around, fighting and collecting special locked boxes is not enough you also get to alter your clothing. It may seem odd in a hard nosed martial arts cop-crook-athon bloodfest that clothes become relevant but it does provide a little extra side challenge. Certain clothing combinations and items add 5-15% to the levelling up scores depending on what you wear. The game is rated 18 and I would hope that most parents realise that this really is 18. The storyline is quite hard hitting at times, the language is always full of swearing. The fighting is pretty gory, you are usually left covered in blood which remains until you change your clothes. That is more cartoony. However, having completed the main story now it got pretty serious at the end. There are a lot of game engine driven cut scenes, some great acting and voice, but the last ones made me wince. This is great as it had not just become a collect -’em up grind. It fitted with the plot (which I am not going to spoil) but it definitely was not one for the kids. There is some DLC planned with new missions. This will be great though having played through the story I wonder how they are going to make this integrated and not just some missions you missed that you go back and play. The video is actually the CNC lathe one but it is brilliant. I think it is a great example of extending a product, in this case resurrecting one. It also made me cry with laughter at its brilliant eccentricity. Veteran – Yes I do read books sometimes! I have just go back from a great 2 weeks mostly off the net in Spain (well nearly!). Whilst I had the Mac with my it managed to stay pretty much closed and I focused on doing a few less techie things. The first of those was my regular Choi Kwang Do patterns which I spent quite a lot of time practicing in the hot sun by the pool at the villa. It was interestingly meditative as well as being physically beneficial despite it being a little out of context for a summer holiday. The holiday though was not devoid of tech. With the ipad, kindle, 2 DSi XL and 1 3DS, plus a TV showing satellite channels including lots of re-runs of Star Trek original series and Voyager we were not totally unwired, just a local net. I finished Splinter Cell on the 3DS despite its initially annoying control mechanism. This post is about something else though. I knew nothing about this except what I spotted on the sleeve, but it looked a good cyberpunk action book. I have to say it was better than good, I even finished it before the end of the holiday. For me it had everything I needed in a book of that nature. Armoured augmented human soldiers, social decay, post apocalyptic gangs, dangerous corporations. It also featured the hackers who access the net directly via a socket in their heads and then represented themselves in all sorts of interesting ways as they dealt with the odd experience of being jacked into the net. There was a lot of shooting and fighting, a lot of rebuilding. So it had the action box ticked. However it actually wrestled with very interesting central issue. I am trying not to give any spoilers here BTW. In a good versus bad with a confused 3rd party in the middle the notion of openness to information was being played out. one digital based information system, or weapon was being developed by the libertarian hackers. Throughout they spoke in open source terms, in a self determination that was working against the corporate, government and warring controllers. It didn’t preach though, it showed the though patterns the characters were taking, their various ideals and motivations clashing at times. However it also showed that they were not totally sure what the outcome of such openness would be, but that it had to be done. I was not expecting such depth of though and reasoning to surface in the book as I was reading the comforting, almost stereotypical augmented soldiers fights. Replaced eyes for lenses (a la William Gibson), the net representation (a la Stephenson). However these were not so much stereotypes as clear genre requirements that were then used to take a further journey into the politics of freedom of information, over command and control structures. It was very thought provoking. So much so I just went and bought the follow up book War in Heaven. Anyway, back to normal, whatever that is. Lots to do this month, several articles to write, some virtual world work to code and the (ever) ongoing search for the right funding for the ground breaking meta game project.